The growth of Oregon’s marijuana industry was on display at the 4th annual Cannabis Collaborative Conference. Marijuana growers in Oregon don’t seem to be too nervous about the federal government taking away the legal market. At the 4th annual Cannabis Collaborative Conference this week in Portland, it’s obvious the industry is continuing to grow. Chris Green has worked hard to create Lovena Green Farms, a marijuana farm in Aurora. He doesn’t think it’s going away anytime soon with the news Attorney General Jeff Sessions is “returning to a rule of law” and enforcing all federal marijuana laws. “We saw Jeff Sessions rescind the Cole memo and a lot of people jumped to ‘Oh gosh, here come the feds, they’re going to kick in our door, things are going to unravel!’ I don’t believe so,” Green said. Oregon has come far. And Russ Belville is cashing in. You know how Airbnb works: you rent out someone’s house or a room when visiting a city to feel like you’re really living there. Belville lost two of his roommates and was looking for a way to pay rent. Being a marijuana advocate, he’s marketing his Southeast Portland home as marijuana friendly, where it’s not only allowed, it’s encouraged as his brochure says. He rents out two of his bedrooms on Airbnb and cooks breakfast for his guests, complete with eggs from his backyard chickens. Not only is he making rent, he’s making money on top of it. Because Oregon law doesn’t allow smoking of any kind in hotels, he’s had guests from all over the world who want to legally smoke when they come stay here. He has plans to take this idea bigger. “I want to franchise the Delta-9 house idea to other cities in Oregon, like Eugene and Medford, and take it through other legal states, like in Seattle, Spokane, L.A., San Francisco, Las Vegas and so forth,” Belville said. Grön Chocolates of Portland is one of the booths at the conference. They were one of the first licensed recreational edibles in Oregon. 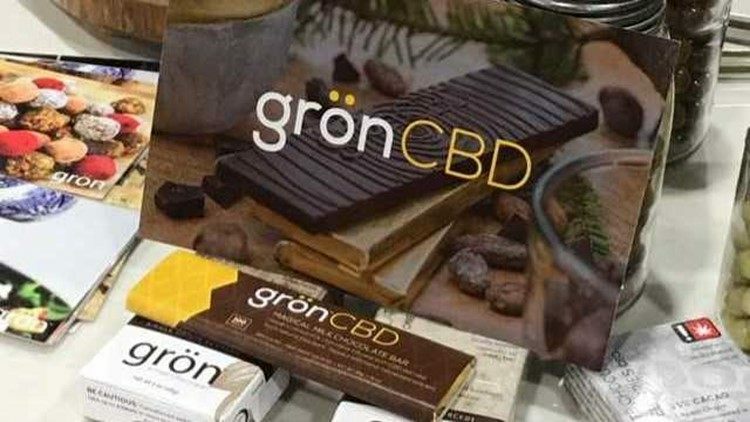 A brand new product they’re coming out with next month is called Grön CBD. It’s a chocolate bar with CBD, which is the compound that relieves pain or helps you sleep, but does not get you high. It’s what strictly medical patients use. But this CBD doesn’t come from a pot plant. Scientists discovered it in the moss that grows on a pine tree in Asia. And because it has nothing to do with marijuana, it can be sold anywhere, in any state. “This is an opportunity for those folks who are really interested in trying CBDs and a natural alternative to pharmacueticals and pills,” said owner Christine Smith. They’re in talks with some local grocery chains to sell it soon. But for now, you can order if from their website.